There are so many concepts, skills and standards to be covered in any given school day, week or year that it can be easy to forget about one simple activity that promotes autonomy and starts students down a path of lifelong learning -- independent reading. Kids are increasingly immersed in their digital devices, leading some adults to worry that reading for pleasure is in danger of disappearing. But creative school librarians are proving there are plenty of great ways to get kids excited about reading on their own. Luhtala is implementing plenty of innovative ideas to get kids reading in her school, but she also asked colleagues around the country to weigh in on great ideas to promote independent reading at every grade level. Book clubs are nothing new, and some especially motivated teachers even participate in these kinds of discussions with Professional Learning Networks to push their practice forward. But many teachers have so much going on that book clubs slide to the back of the priority list, especially if they are expected to read kids books. Tamara Cox knew time was her hurdle when she launched a book club for Anderson School District One teachers in South Carolina. She lobbied the district to give continuing education units for participation, justifying her argument by linking a new tech tool to every book the group discussed. With that incentive, a huge number of teachers wanted to participate in the program, so Cox broke them up into groups based on the age group they taught. Every month they read a book from a different genre or theme, casting a wide net with their choices. “They were really adventurous; they opened it up to everything,” Luhtala said. Students were excited to see their teachers seriously discussing the graphic novels, manga and horror books that they might have chosen for themselves. “What a great way to get your teachers to model reading for their students,” Luhtala said of the program. And, it had the added benefit of giving teachers and students common books to discuss. This might seem like a waste of time, but Cox found the program legitimized the kinds of books students love, introduced teachers to fun literature they might never have made time for, and sparked great conversations between the two groups. “If you are confused about where to start, pick something that will surprise your teachers and jazzes your kids,” Luhtala recommended. Along the way, Cox paired tech tools like Tellagami, iMovie, Puppet Pals, Venn Diagram, Trading Cards, Visual Poet and Chatter Pix (everyone’s favorite) with each genre. She encouraged kids to make book trailers for each title on the reading list, which involved students in the project, let them show their excitement about books and helped teachers understand how the various tech tools could be used in the classroom. Crucially, Cox took a lot of feedback from teachers after the first teacher reading club. She’s working to tailor the experience even more to the needs of the classroom. The whole experience also helped build collaboration between teachers and their school librarian. When Sherry Gick became the library and instructional technology specialist at Rossville Consolidated Schools in Indiana, she was troubled that ever-younger students would tell her they hated reading. That promoted her big goal: make the district a place where independent reading thrived. After six years as a librarian, even substitute teachers tell her they notice how clear it is that kids love to read. Gick worked to make the library a more student-centered place by moving the books into genre sections. This could be a librarian’s worst nightmare, but she let the kids help her decide which genres to use and where different books fit, emphasizing there was no right or wrong answer. Gick ended up classifying books into 10 genres: sports, history, realism, fantasy, supernatural, suspense (horror), mystery, classical, adventure and science fiction. “The fact that she involved the kids in the discussion brings up that culture of reading,” Luhtala said. “They feel like they have ownership of this.” The middle school students did most of the classifying, which had the added benefit of emphasizing some Common Core standards like reading for information, scanning for the big idea and, of course, classifying. Many books fit in multiple genres, but since students got to decide, the library reflects their thinking. When kids visit the library, Gick doesn’t ask them what they like to read. Instead, she asks them what movies, TV shows or video games they like in order to get them interacting with her in some way. “Then you can steer them toward one section where they feel comfortable, so they have a space they can go,” Luhtala said. And often authors write books that fit into multiple genres. If a student discovers Rick Riordan through his famous "Percy Jackson and the Olympians" series, she may also read some of Riordan’s mysteries and discover a new genre. Genre-fying the library meant that Gick had to split the Dewey system of ordering books. Rather than putting autobiographies of sports greats in one section and fiction about sports in another, she combined them. Taking this approach made location the highest priority and meant that she didn’t have to change all the spine labels. Gick also worked with classroom teachers to bring K-8 classes into the library, where they got to choose their own books and read silently. High school classes did something similar, depending on the teacher. Gick makes sure the kids have lots of choices in terms of content, but also in format. She’s got paper books and ebooks, offers ways for kids to discuss books online and in person, and stays away from book quizzes. All the librarians emphasized that conversations about books keep reading social, relevant and fun. For many students, personal interactions are becoming less common as life becomes more digitally focused. Many librarians or English teachers have tried to start student book clubs to encourage independent reading and have seen them fall flat because of too little interest. Librarians across the country teamed up to make a more robust club that meets in person at individual schools and then online with peers across the country using Google Hangouts. They have a Goodreads page and Twitter hashtag (#SWVBC), calling themselves the Somewhat Virtual Book Club. “It helps you to know what you believe in and maybe even question your own opinions about what’s happening in the world,” said Rosemary, a rising sophomore at New Caanan High School. She likes connecting with students on the other side of the country and discovering they’ve read the same Tumblr post she has or have really different ideas about a book they both read. Other librarians and teachers are using the virtual world to connect students to the authors of books. The class will tweet at an author or invite her to Skype into the class for a few minutes. 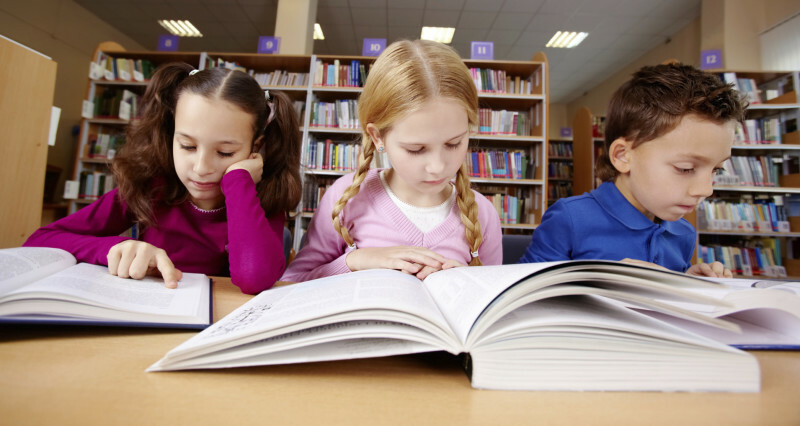 These real-world interactions can help reading feel more exciting for students. In Parsippany-Troy Hills, New Jersey, Elissa Malespina has found a little friendly competition with a silly reward can go a long way to getting students reading. At the elementary level, she sets a goal for number of books each child should read. And when students reach the goal, a pre-determined silly-something happens: The principal might shave his head, or dye his hair red for a day, or participate in a dunk tank. Meanwhile, at Sedgwick Middle School in Connecticut, Shannon McNeice has her students participating in Book Trivia Battles at the local public library. Preparing for the battles means reading lots and lots of books. McNeice has found other ways to make reading social, too, launching an Instagram campaign called “What Are You Reading?” that has been fairly successful. At Sanislo Elementary in Seattle, Washington parent volunteers have started a book-a-day program where each student gets to borrow a new book every night. The books are tracked, and about 90 percent come back each day. All of these ideas get kids excited about reading, talking about what they’ve read, and developing the habit of reading. It’s an easy way to give students choice and broaden their horizons as standards require more specific kinds of reading in class. Many librarians have found that getting kids hooked on a series is a great way to extend reading into the summer, too. Ultimately, cultivating independent readers must be about helping students find the joy in reading. That requires lots of choice, little judgment, many formats in which to read and lots of online, analog and face-to-face opportunities to share thoughts about the book.